At Beko we are committed to energy saving, not only for the good of the planet but also for the benefit of our bank balance. Upgrading your appliances to our EcoSmart range can help you save £118 a year in electricity bills  , but that's not the only way you can cut back your energy usage in the kitchen. The average electricity bill in the UK is around £560 per year. Beko has partnered with the Energy Saving Trust to help you reduce your bill with these simple energy saving tips. If everyone in the UK upgraded their fridge-freezer to an A+ model it could collectively save up to £500 million a year. Replacing an old gas boiler with an A-rated high-efficiency condensing boiler and improving your heating controls could save you as much as £305 a year. Don’t fill up the kettle every time you want to make a cup of tea. Use the water that’s left in it before filling it up again. If everyone in the UK upgraded their tumble dryer to an A-rated model, it could save up to £140 million a year. Enough to pay for 2.1 million home’s lighting bills. Save £40 per year on average on your electricity bills by replacing Halogen downlighters with CFLs or LED alternatives. Add chemical inhibitor liquids to your central heating system to prevent corrosion and scaling and to ensure it doesn’t cost you extra to heat your house. Fuel switching: Gas is cheaper than electricity or oil. 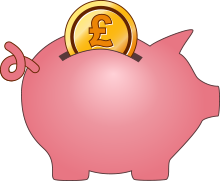 Save £20 - £30 a year by insulating your hot water cylinder. Installing a water heater will help ensure you are not paying excess bills for water you haven’t used. 30°C is the new 40°C! The 30°C wash programmes on Beko EcoSmart washing machines give you great results. This helps save money on energy bills. This logo can only be used on the most energy efficient products; usually the top 20% of those available. 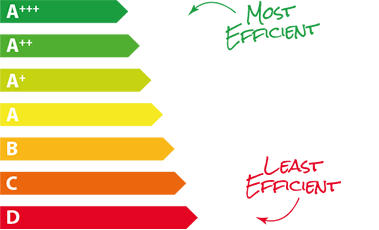 The EU energy label rates the energy efficiency of a product. The more efficient a product, the more you can save on your energy bills. That’s enough to buy 92 washes worth of washing powder every year! Or enough to give you the first 155 washes for free every year! Replacing a 12 year old dishwasher with a new model will save you around £120 in energy bills over 10 years and 430 kg of carbon dioxide. * : Based on proportion of the total annual electricity consumption in the UK 2013 for all wet appliances, cold appliances and electric cooking appliances. Sourced from Domestic Energy Consumption in the UK (DECC) 2013. ** : This is the percentage difference between a B rated which was the most bought in 2012, with an A rated oven, based on the energy used to heat a standard load in a similarly sized B rated oven. **** : Based on DECC's MLSOA 2011 data, using average EST electricity price of 13.52p/kWh. Valid for 2014. † : When replacing 4 appliances to Beko EcoSmart. Savings are based on comparing the most bought energy rating in 2012 for each appliance type with WMB91242LC, DSFN6839W, DPU8360W models and replacing an existing 10 year old fridge freezer to GNE114610APX.Based on an average electricity price of 13.52p/kWh, EU Energy Label data, and includes heat replacement effect. Valid for 2014. ‡ : Based on a sales weighted average annual saving between all the Beko EcoSmart product within an appliance category versus an C-rated model which is the most bought in 2012. Using an average electricity price of 13.52p/kWh, EU Energy Label data, and includes heat replacement effect. Valid for 2014. § : Based on a sales weighted average annual saving between all the Beko EcoSmart product within an appliance category versus an A-rated model which was the most bought in 2012. Using an average electricity price of 13.52p/kWh, EU Energy Label data, and includes heat replacement effect. Valid for 2014. 1 : Based on a sales weighted average annual saving between all the Beko EcoSmart product within an appliance category versus an C-rated model which is the most bought in 2012. Using an average electricity price of 13.52p/kWh, EU Energy Label data, and includes heat replacement effect. Valid for 2014. Many kitchens still have light fittings using halogen bulbs. Often the fittings will have four or five of these bulbs that are very energy hungry and consequently expensive to run. Not only do they give off light they also get very hot – a sure indication of high power consumption. Far more efficient replacement bulbs are readily available in the form of compact fluorescent lamps (CFL) or light emitting diode (LED) light bulbs. These alternatives use far less energy than the halogen type. This replacement could save as much as £40 per year on the average electricity bill. If a central heating boiler is more than ten years old it is now regarded as old technology. Replacing an old boiler in an average semi-detached house can mean a yearly saving of as much as £305. If when the new boiler is installed thermostatic radiator valves and a fully programmable thermostat are also fitted a further saving will be made in fuel consumption. Water central heating systems also benefit from the use of a chemical inhibitor. This is a liquid which can be added to the system to inhibit corrosion in the pipework and radiators and reduce scaling, a particular problem in hard water areas. Scaling builds up over time and will reduce the efficiency of the boiler. A great deal of water can be used in a domestic kitchen over a 12-month period, installing a water meter will help you measure your usage and ensure you are not paying excess bills. Choosing an A+ or higher rated Beko EcoSmart dishwasher can save you around £115 over 10 years. Don't waste energy washing your clothes on an unnecessarily high temperature – thanks to developments in detergents and our Beko EcoSmart washing machines you can achieve great results at 30° where you once would have washed at 40°. Small changes can make big savings to your energy usage in the kitchen, and these savings will be passed on to your bills. Beko's EcoSmart range is approved by the Energy Saving Trust, so you know it's a safe investment for your future. As well as following our energy saving tips, did you know you can also save hundreds of pounds by switching your current appliances to Beko’s EcoSmart appliances? Switching to an Ecosmart tumble dryer can save you £475 over 10 years or the first 4000 washes for free. Upgrade your 10-year-old fridge freezer to a Beko ecosmart model , and you can save around £100 in electricity bills over 10 years. Choosing an A++ or higher rated EcoSmart washing machine would save around £195 in energy bills over 10 years. If you choose an A+ or higher rated EcoSmart dishwasher, it could save you around £11 every year. That's enough to buy 77 tablets for your dishwasher every year, or enough to give you the first 90 dishwasher loads for free every year! When replacing 4 appliances to Beko EcoSmart. Savings are based on comparing the most bought energy rating in 2012 for each appliance type with WMB91242LC, DSFN6839W, DPU8360W models and replacing an existing 10 year old fridge freezer to GNE114610APX. Based on an average electricity price of 13.52p/kWh, EU Energy Label data, and includes heat replacement effect. Valid for 2014. Based on DECC's MLSOA 2011 data, using average EST electricity price of 13.52p/kWh. Valid for 2014. Based on a sales weighted average annual saving between all the Eco Smart Beko product within an appliance category versus an A-rated model which was the most bought in 2012. Using an average electricity price of 13.52p/kWh, EU Energy Label data, and includes heat replacement effect. Valid for 2014. Based on a sales weighted average annual saving between all the Eco Smart Beko product within an appliance category versus an C-rated model which is the most bought in 2012. Using an average electricity price of 13.52p/kWh, EU Energy Label data, and includes heat replacement effect. Valid for 2014. Based on an annual average saving between all the fridge-freezer Eco Smart Beko products versus a weighted average consumption for similarly sized fridge-freezers in 2004. Using an average electricity price of 13.52p/kWh, EU Energy Label data, and factors in heat replacement effect. Valid for 2014.